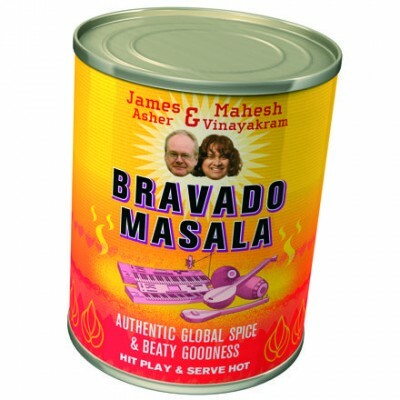 Bravado Masala : Mahesh Vinayakram, Indian virtuoso singer and improviser extraordinaire, teams up with worldbeat drum artist and producer James Asher for a selection of melodic adventures. Ranging in mood from rhythmic and danceable to thoughtful, nostalgic and contemplative. Mahesh’s musicality and exuberant enthusiasm finds an unusual and satisfying pairing with James’ strongly atmospheric grooves. The resulting dishes are both highly distintinctive and individual, but also highly tasty, and the integration and synergy of these unusual spicy flavourings may be effortlessly savoured by the most discerning palates. Background : Mahesh Vinayakram comes from a famous Indian musical family. His father Vikku Vinayakram heads a family of master drummers and percussionists. Vikkhu himself is a worldclass percussion maestro, specialising in ghatam, who has played for John McLaughlin’s Shakti, and received several grammy nominations. Mahesh Vinayakram’s brother Selva Ganesh, also is recognized as the world’s finest kanjira player – a goat skin percussion instrument resembling a tambourine, whose pitch can be varied with one hand, whilst the other delivers blistering, astonishing rhythmic phrases that defy belief. Another brother of Mahesh Vinayakram’s is Umashankar – another ghatam virtuoso. Mahesh has spent some years exploring fusion within a broad palette of world music. It was this journey that led Mahesh originally to join James Asher in recording Drums on Fire with master drummer Sivamani. Credits : Recorded at Starfield Studios, Eastbourne, Sussex – August 2007. Mixed by Grahame Gerrard and James Asher. Produced by James Asher. All compositions by James Asher and Mahesh Vinayakram, except The Golden Mean by Arthur Hull, James Asher and Mahesh Vinayakram and Tabletop Dancer by Simon Webster, James Asher and Mahesh Vinayakram. Music published by Radiant Music. Guest Musicians:- Hang drum on The Golden Mean by Arthur Hull, Darabuk on Tabletop Dancer by Simon Webster, Guitar on Lost Summer, Tabletop Dancer and Bravado by Tom Askaroff, Electric Piano and additional strings on Bravado Masala by Rod Pooley.